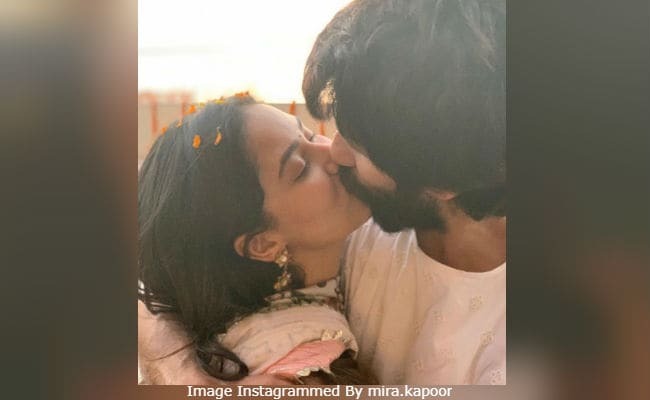 All of the pictures shared by Shahid Kapoor and wife Mira Rajput on Diwali, we have picked out our favourite. It's a picture of Shahid and Mira kissing each other and it couldn't get more romantic. "Only love," Mira captioned the loved-up picture and added, "Happy Diwali." The Internet just can't stop gushing over the couple's photo and comments like "so sweet" and "nazar naa lag jaye" have been posted. For the festival, Mira chose to wear a peach coloured salwar suit and Shahid complemented her in a white kurta pyjama set. Shahid also shared an adorable picture with Mira and gave the best caption to it. "Happy Diwali everyone. Hope you spent it with those who matter most," he wrote. Shahid and Mira's kiss of love! Meanwhile, Shahid Kapoor posted an adorable picture with his daughter Misha, in which the munchkin can be seen curled up in her father's arms as he happily smiles for the camera. Shahid captioned the post: "Moments we live for." happy Diwali everyone. Hope you spent it with those who matter most. Mira also shared a picture of herself along with Shahid, Misha and her mother-in-law Neelima Azim, who also wore a pink outfit. Mira captioned the picture in the best way possible. She wrote: "With Dadi Ta-Thai-Thai-Tat." Shahid's brother Ishaan also joined the family for Diwali. Mira shared a picture with her dewar and wrote, "Nice to see you today." Here's baby Misha's picture to brighten up your day. "You are my sunshine, my only sunshine," Mira wrote for Misha. Meanwhile, here's a sneak peek of the Diwali décor at Shahid and Mira's Mumbai home. (Happy Diwali, Shahid and Mira. We hope you share baby Zain's picture too). Shahid Kapoor and Mira Rajput married in July 2015 and Misha was born in August 2017. The couple welcomed their second child, a boy whom they named Zain, in September this year. Professionally, Shahid, who was last seen in Batti Gul Meter Chalu, is currently filming Kabir Singh, the Hindi remake of Telugu film Arjun Reddy. Kiara Advani is Shahid's co-star in Kabir Singh.